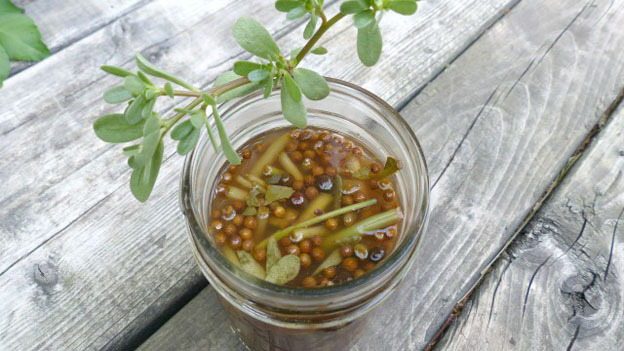 Purslane stems are often discarded so why not pickle them? No sense tossing the stems when these tasty, nutritious, pickled purslane stems can be enjoyed in a sandwich or salad. (Fill jars with fresh garlic and or fresh dill before continuing with the below instructions.) Mix the salt and the ice water in a large bowl. Chop the purslane into 1-3” pieces. Peel and thinly slice the onions. Place the purslane and onions into the ice water brine and chill them in the refrigerator for minimum 1 hour. Mix the apple cider vinegar, sugar, mustard seeds, turmeric and two cups of water together in a stock pot. Heat the mixture until it boils, stirring occasionally. Add the chilled purslane and onions to the boiling mixture using a slotted spoon. Bring back to a boil and continue boiling for five minutes. Remove the pan from the heat and allow the entire mixture to cool in the pan. Spoon the purslane and onions into mason jars using a slotted spoon then add the juice to each jar. Seal tightly and keep refrigerated.